Initiated in 1978, the Girls’ Craft Centre, which was renamed as Kalyani Karlekar Shilpa Shikshalya, is organised for older girls and women for training and earning by needle work, tailoring and knitting. Products range from dresses, embroidered saris, lace, and zari (gold) thread work to jute bags, carpets and various articles of household use. All uniforms and other clothes of the learners and inmates of the Home are made by them. Girls with education up to standard VIII of high school are trained and sent up for the Lady Brabourne Diploma Examinations of the Government of West Bengal. The Centre functions on Tuesdays to Saturdays between 1 to 5 p.m. The Centre is managed by a Governing Body member and 4 teachers. Currently there are 35 trainees in the centre. 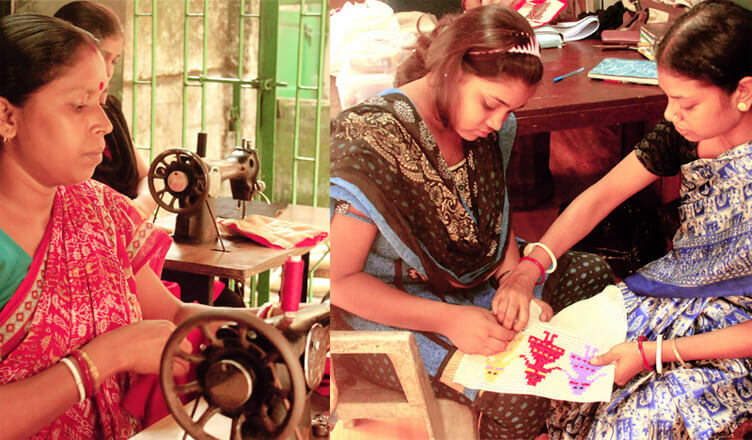 Calcutta Social Project has been a part of the Raymond Tailoring Training program since June 15, 2015. Raymond Ltd along with the Department of Technical Education and Training (DTET) of the Government of West Bengal organises skill training programs in tailoring for the marginalised and unemployed youth. This program targets mainly women and youth and brings in a sense of empowerment among them by not only teaching them new skills, but also by upgrading their current skill set, thereby improving their status in society. Some of the skills taught to the students include high speed motor machine control, simple stitching, drafting, cutting and stitching pyjama’s, and cutting and stitching small parts of half/full. This a social initiative has been undertaken by Skilled Training Institute by Raymond (STIR), which is a public charitable trust from the Raymond Group. STIR undertakes employability linked skill development training programmes free of cost and also helps trained students join the profession through industry placements.